A side effect is any unwanted medical occurrence in a patient who has been given a pharmaceutical product that may or may not have been caused by treatment with the product. A side effect can therefore be any unfavorable and unintended sign, symptom, or disease associated with the use of the product. By reporting side effects for Medreich products you help us to ensure the safety of our products and our patients. Your information will also enable Medreich to fulfill its reporting responsibilities to health authorities, which requires that we provide information on side effects with our products – even in cases where a relationship between the product and the effect is not established. If you or the person you are reporting on behalf of are currently suffering from severe side effects you should contact your local doctor or other medical health professional before reporting the side effect. Medreich can't give you medical advice – talk to a doctor or pharmacist. Always read the patient information leaflet, or instruction supplied with your medicine. It lists the known side effects or problems and advises you on what to do. Medreich pharmacovigilance team shall triage serious and non-serious Adverse event cases, performing detailed case entry and follow-up, narrative writing, quality reviews and medical review, finally to enable on-time reporting around the globe to health authorities. 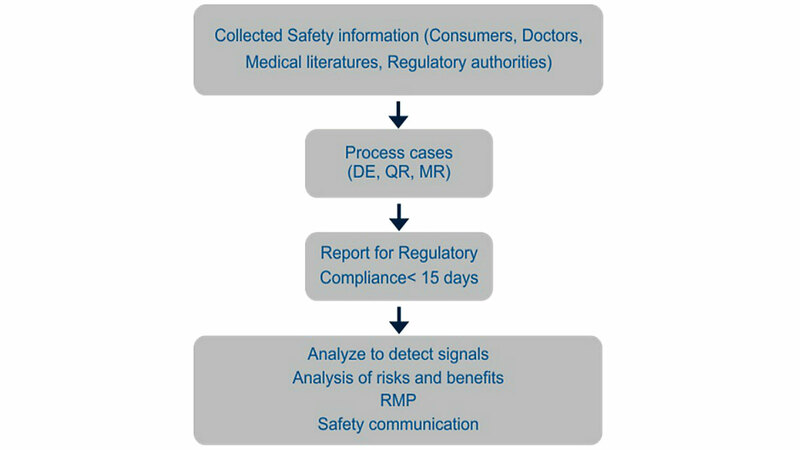 This information will also be used for compilation of periodic safety update reports, signal detection, and risk benefit analysis of the product. It'll be recorded to help prevent similar incidents in future. You'll receive a confirmation of your report. You'll be contacted if you need to provide more information. Pharmacovigilance (PV) is the science relating to the collection, detection, assessment, monitoring, and prevention of adverse effects with pharmaceutical products. The primary objective of PV is to ensure patient safety by identifying the potential risks of the marketed products. The pharmacovigilance department has implemented the Global safety database and has developed a quality management system to ensure compliance to regulatory requirements.